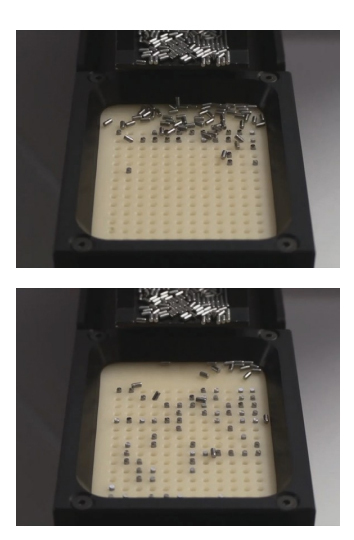 The system has been designed to enable the picking surface to be changed very quickly. 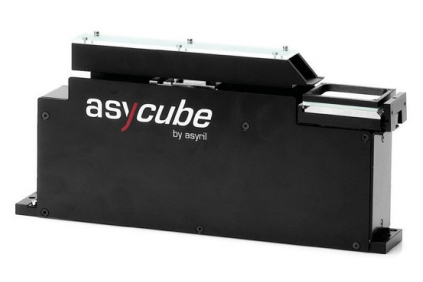 The combination of Asyril’s 3-axis vibration “Asycube” flexible feeder and structured plates (grooves, holes, etc.) offers a significant increase in the speed and precision for flexible feeding as well as pick & place applications. Traditionally, feeding components into automation machines is very often carried out by bowl feeders, for which the changeover from one batch to another is generally long and tedious. Recently, thanks to advances in the field of computer vision, flexible feeding systems have appeared on the market. The principle is simple: components are delivered and distributed over a surface in the field of vision of a camera. The camera takes a picture, locates the components and gives this information to a manipulator, which picks them up. Asyril has successfully introduced the Asycube family of flexible feeding systems for parts and components from <0.1 up to 50mm (<0.01 up to 2 inches) to the market. The patented technology uses vibrations in 3 dimensions (X, Y & Z axis), which allow optimal distribution of the components on the picking surface as well as targeted part orientation. The system has been designed to enable the picking surface to be changed very quickly. This feature enables the surface, if necessary, to be structured differently for each component to be picked up. By making holes or grooves on the surface and inducing an intelligently chosen vibration sequence, for example, the components can be pre- oriented. Long objects can, for example, be introduced vertically into holes, resulting in a high level of availability of components that are ready to be picked up by the robot, and allowing more time for the assembly operation. This characteristic is essentially due to the smoothness and gentleness of the vibrations that can be induced by the Asycube. Traditional flexible feeding systems do not offer this feature. Asyril offers high performance flexible feeding systems for parts and components from <0.1 up to 50mm (<0.01 up to 2 inches) in size. Our innovative technology operates geometry-independent, allows for extremely gentle part feeding and has proven to be highly cost-effective, satisfying countless internationally renowned customers for many years.